Handler paid $500,000 to become the sole sponsor of the Mickey Mouse Club -- the value of the entire Mattel Company. The gamble paid off; she was the first to successfully market toys directly to children, not their parents. 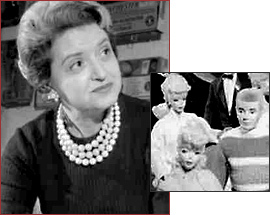 A California stenographer created the doll that became an American icon and a multibillion-dollar business. Ruth Moskowicz was born into a family of Russian Jewish immigrants in Denver, Colorado in 1916. She married her high school boyfriend, an artistic young man named Elliot Handler, and they moved to Los Angeles in 1938. After her husband decided to make their furniture out of two new plastics, Lucite and Plexiglas, Ruth ambitiously suggested that he turn furniture making into a business. Her antennae up for opportunities, she acted as his sales force, closing a big deal with Douglas Aircraft, among others. During World War II, the Handlers started a company, Mattel, combining Elliot's name with the last name of their partner, Harold Matson. On weekends home from wartime duties at Camp Robert, California, Elliot made toy furniture for Ruth to sell. By the mid-1940s, the young company would be taking in revenues of $2 million ($21.6 million in 2003 dollars). Borrowing money from A. P. Giannini's Bank of America, Mattel presided over a plastic ukelele fad, sold toy pianos, and launched a music box that sold 20 million units by 1952. The Handlers took their two teenagers -- Barbara and Ken -- on a trip to Europe in 1956. There, they saw a doll that looked like an adult woman, vastly different from the baby dolls most little girls owned. Ruth was inspired. Three years later, Mattel's version, Barbie, would debut, with a wardrobe of outfits that could be purchased separately. In 1960, the Handlers took Mattel public, with a valuation of $10 million ($60.3 million in 2003 dollars). It was on its way to the Fortune 500, and Barbie quickly became an icon, with ever-changing wardrobe and career options that mirrored women's changing aspirations. In the early 1970s, Handler was diagnosed with breast cancer and underwent a mastectomy. She resigned as president of Mattel in 1973. Soon, though, she was working on a new product: a comfortable breast prosthesis. Handler created the "Nearly Me" line, which still produces and distributes breast replacements and post-masectomy swimwear to customers internationally. Handler died in 2002.